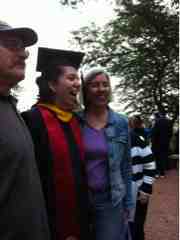 Claire had her formal graduation yesterday in College Park, MD. 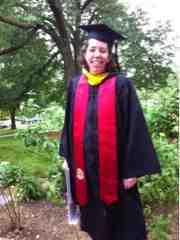 She has a Bachelor of Science degree in Geography with a Sustainablity minor and a concentration in GIS. Map making using data, writing code using Python, and helping to change the face of data. Her internship this spring started as an unpaid venture, and then became paid. Her applications are in for full time work in her field, and she has been accepted (and has deferred for a semester at least) to grad school at University of Maryland. She has no debt to speak of. Her dad kept teasing her about outstanding parking tickets and overdue book fines...even when he graduated, schools held the actual diploma until the student paid their debt. I went with a friend to collect his diploma when I was in college, and he owed more than $300, could not get the paper until he aid up! She does not need to do that.